Active adult is gaining momentum with senior housing investors, but the asset class has one final obstacle in the way of becoming the most sought-after product type. Active adult has surpassed memory care as an investment focus and trails only independent living as the most popular senior housing product type, according to the 2019 Senior Housing Outlook Report, compiled by Hunt Real Estate Capital and Senior Housing News. The report is based on responses from 250 senior living professionals, surveyed in November and December 2018. This graph shows the attractiveness of various senior housing product types, by investors, in 2019. Active adult is not yet considered a pure health care play, Hunt Real Estate Capital Senior Managing Director, Seniors Housing & Healthcare Kathryn Burton Gray told SHN. The age range for active adult communities is 55-plus. This has these communities competing with luxury apartment buildings and intergenerational communities for renters. Still, investors remain bullish on active adult’s future prospects. 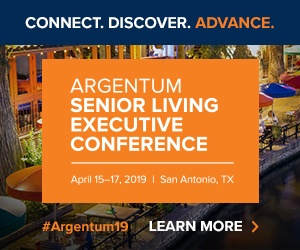 More than 65% of survey respondents expect occupancy in active adult rental communities to grow this year, the highest number among the six senior housing product types covered in the survey. Once active adult makes the jump to a straight health care investment, the sky is the limit, Burton Gray said. Investors are interested in active adult for several reasons, including that it holds the promise of attracting the leading edge of the aging boomer demographic, which is still about a decade away from entering more traditional senior living communities en masse, according to a recent Senior Housing News report on the rise of active adult options. Another factor to keep a watch for in 2019’s early weeks is the government shutdown. Already in its fourth week, the impasse has temporarily shuttered the Department of Housing and Urban Development (HUD). This is resulting in a growing backlog of deals seeking bridge financing, Burton Gray said. “Lenders will not lend unless there is permanent financing set up,” she said. And banks were already scaling back their lending before the shutdown, lending mainly to deals with strong sponsorship and slowing the flow of construction financing to a drip. Burton Gray said only a handful of banks are underwriting construction financing. An overexposure to real estate will impact a bank’s CAMELS [capital adequacy, asset quality, management, earnings, liquidity, sensitivity to market risk] rating, limiting an institution’s ability to do acquisitions in the future. Currently, banks are comfortable lending at a 55% to 60% loan-to-cost ratio. “The banks are uncomfortable with the velocity of real estate exposure,” she said. Twenty-three percent of respondents plan to buy senior housing properties in 2019, while 17% indicated they would hold onto their assets. Private equity will continue flock to the market. Forty-three percent of respondents expect private equity to remain the top investor in senior housing. New construction and renovation of old properties are equally attractive as a growth strategy. Twenty-nine percent of respondents said new construction would be the best growth strategy, while 28% preferred renovating and repositioning existing buildings. Interested in learning more about the new active adult housing? Click here to access Senior Housing News’ deep-dive report on the topic.